I know what you're going to say.. another tag post? But yes! I recently saw this tag post on the lovely Shona's blog (freshbeautyxox) and knew that I had to get involved! I love lipsticks, they are my weakness so this is the perfect post for me! Well I've just had a round-up and a count and I can't believe that I actually own....59 lipsticks!!! (and counting... as there's a few I have my eye on) That is just basic lipsticks, not even including lipglosses, lipblams etc etc - I think this is alot?! What do you guys reckon? Am I ridiculous? Wow.... I cannot remember! I'm nearly 24 now so the first lipstick I had was a good while ago! It was probably something that my Mum gave me, probably from Avon! I do remember buying Nivea's "Pearl & Shine" (don't know if it's still called that!) when I was about 12 when it first came out though! Well I LOVE Mac lipsticks - but they aren't something I buy lots of as... well... I cannot afford it! I only own about 5! The brand I use most and my favourite "drug-store" brand though is Rimmel! I have so many amazing lipsticks from them, they never dissappoint. My go-to lipstick has been the same for years, Rimmel's Kate Moss Lipstick in shade 20! It is my favourite for a (*classic phrase alert...*) 'pop of colour'! Whether it is for a big night out or just popping out to town I love this shade! Erm... I'm not very good at this?! Lustre? Whatever Rimmel's Kate Moss lipsticks are - they are a great finish! Well I've actually been on a make-up ban for a month (go me!) so it's been a good few weeks since I've bought one. But I think it was probably either Mac Rebel or Rimmel's Moisture Renew Lipstick in the shade Dark Night Water-loops. 8. I have my Collection Little Mix Perrie Lipstick, Mac's M.A.C. Red Lipstick, Sleek's Mystic Lipstick, Baby Lips in Pink Punch, Barry M's Bubblegum lipgloss, 2x Nivea Lip Butters & Rimmel's Apocalips in Across The Universe! What lipstick do your use to rock a red lip? I have a few that I like to use! Mac's M.A.C. Red lipstick, Rimmel Kate Moss 107 Lipstick and Apocalips in Big Bang & Across The Universe. I actually have little tand which holds 24 lipsticks - this is what I keep my current favourite and most-worn in. The others are all in a draw bt I am hoping to buy some more holders soon so I can fit all of them out! Next on my list to buy is another one of the Rimmel Moisture Renew Lipsticks. It is the shade Oxford Street Fuschia and it is a gorgeous baby pink! 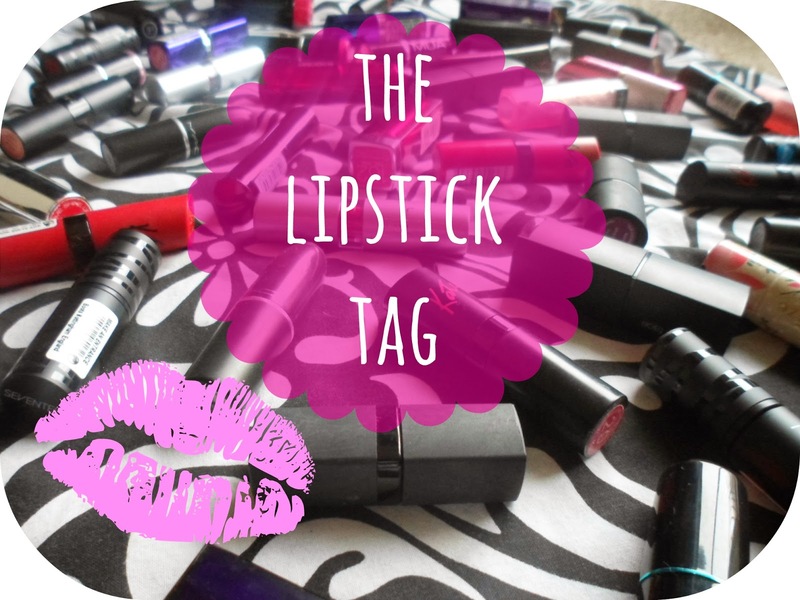 So there we have it the Lipstick Tag - I would love for you girls too join in so... I tag you ALL! Please let me know if you do it, I would love ot read all about your collections and favourites! lovely post, I'll definitely be doing this tag next week! I have to agree; Rimmel 'Kate Moss' lipsticks are my favourite too!! Affordable and great colours. no 16 is my favourite! I love this tag! I have way too many lip products, mostly glosses though! I love love love this tag! I don't have as many as you though! 59 sounds like a dream! I love this tag! Really fun to read - I love how many you have n your handbag - I'm just the same! 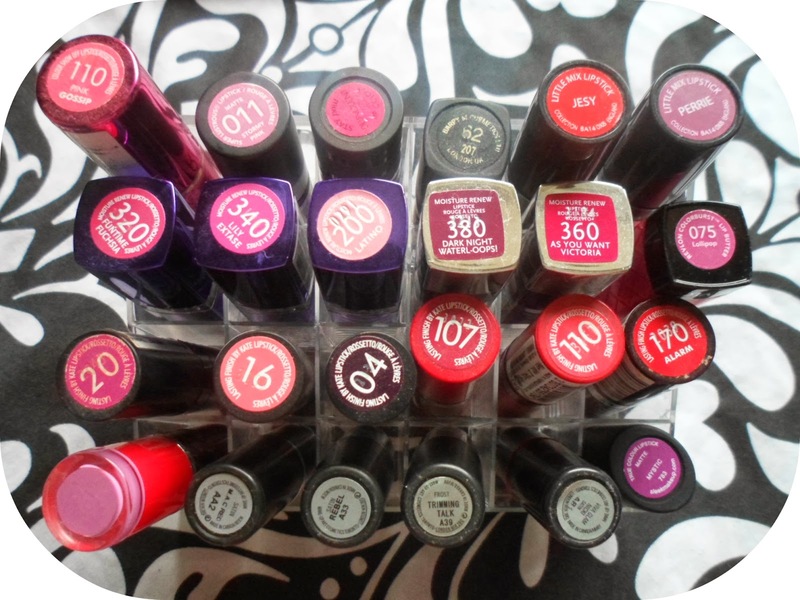 I really want to try the Rimmel 107 one...next on my list! I need to get back into reading your blog!! I love it! you always find such great tags aswell!! I may just have to give this one a go! I done the christmas tag you had up! got me all festive now hehe!! haha I know I'm shocking! I love this tag! I'll definitely do it! !